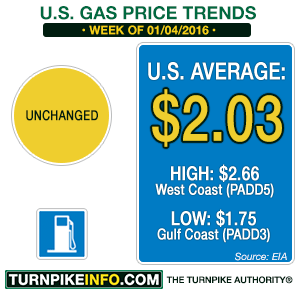 Fort Lauderdale, FL – The price of gas reached another new low during the past week. 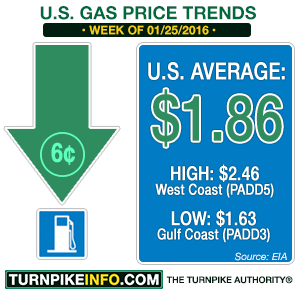 The average price of a gallon of regular unleaded gas is down to $1.86 across the U.S., according to the weekly petroleum update from Energy Information Administration. The only region where gas is officially above the $2.00 threshold is the West Coast, where the influence of California drags the averages significantly higher. Meanwhile, the price of diesel continues to come down, as well. The EIA report shows the weekly diesel price dropped to an average $2.07 per gallon, though some regions are now enjoying price averages below $2.00. Fort Lauderdale, FL – The price of gas across the United State has officially fallen below $2.00 for most drivers across the United States. The weekly gas price survey from the Energy Information Administration, delayed for the federal holiday this week, reported the average price for a gallon of regular unleaded has now fallen to only $1.91. That price is a 9-cent drop from last week. Drivers across the broad west coast region are the only group, as a whole, still paying well over $2.00 per gallon to fill up the tank. Fort Lauderdale, FL – The cost of filling up the tank continued to drop during the past week, with the official U.S. price average falling below the critical $2.00 threshold. According to the Energy Information Administration, the average price of a gallon of regular unleaded dipped over three cents on the week to settle at $1.996 per gallon. For drivers in most regions, the price of gas is well below the national average, but the cost of gassing-up in California, and the higher prices across the broad west coast region, tend to drag the nationwide averages higher. Aside from the west coast survey district, only the central Atlantic states have a regional price average over $2.00 per gallon, as of the release of the January 11 survey data. Fort Lauderdale, FL – The price of gas fell for most drivers across the U.S. during the New Year’s holiday, but continuing price increases in California weighed down the national averages, preventing the U.S. weekly price index from changing on the week. That means that, at least technically, the average driver in the United States is paying $2.03 for a gallon of regular unleaded, according to the Energy Information Administration. For drivers outside of California, the price of gas continued falling in nearly every survey region, including the midwest, where costs had gone up the previous week. The averages across the broader west coast region did not move, even with California removed the formula.